Byron was born on the 9th of June 1922 in the village of Y Bryn, just outside Llanelli, Carmarthenshire. He gained double degrees in Philosophy and Welsh Language/Literature, before training to become a Congregational minister at Memorial Theological College, Brecon and gaining his post-graduate BD. Having taught in several state schools, as well as extra-mural lecturing for the Universities of Aberystwyth, Birmingham and Nottingham, he became Head of Religious and Moral Studies at Eaton Hall College for Teacher-training, Retford. It was during this phase of his life that Byron initiated two projects for disadvantaged children, for which he was awarded the Queen’s Silver Jubilee Medal. After further degrees at Masters and Doctoral levels, Byron was appointed Dean of Geneva Theological School, later to become Greenwich School of Theology. In 1997, the School was accredited by the Open & Distance Learning Quality Council and later in the same year formal co-operation was initiated between GST and Potchefstroom University for Christian higher Education (later to become North-West University). In 2001, North-West University conferred on Byron the ThD (Honoris Causa). Byron was for many years the heart and soul of the management of GST. With great skills and expertise he served as the Dean of the Board of Directors and apart from the responsibility to govern and manage GST, he proved to be a very solid and committed academic. He guided many students in order to obtain either a Master or Doctoral degree via GST from the NWU. It is remarkable how many of the Alumni of GST & NWU, who were his students, mentioned their appreciation for how he contributed to their success as academics. 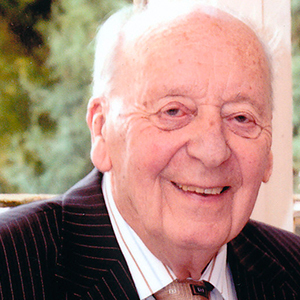 Byron was a family man throughout his life, delighting in time spent with all members: his wife Peg, son and daughter and their spouses, his five grandchildren and in recent years with his great grandson, Stanley. It was a life well-lived and the world is a poorer place at his passing. We shall miss him greatly.